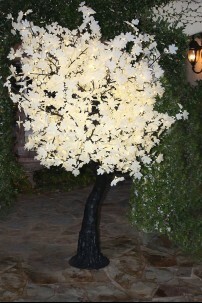 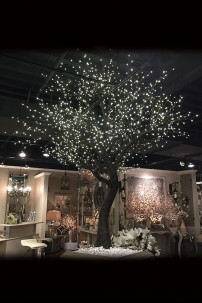 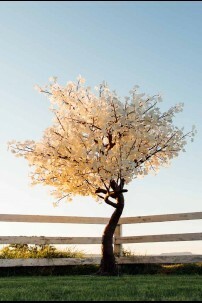 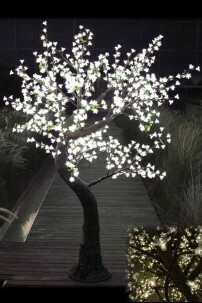 Immediately intriguing, and undeniably unique – Starlit Forest trees have been designed to captivate, making them ideal for major events, commercial design projects, special occasions and extraordinary home décor. 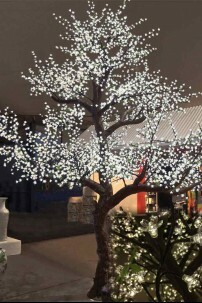 Available in a wide range of styles and sizes, each of these life-sized replicas features thousands of warm-white LEDs sure to impress in any setting! 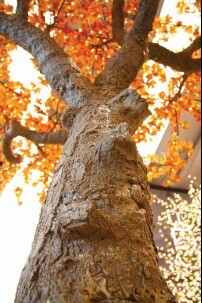 PLEASE NOTE WHILE THE TREES ARE WATER RESISTANT FOR LIMITED OUTDOOR EXPOSURE. 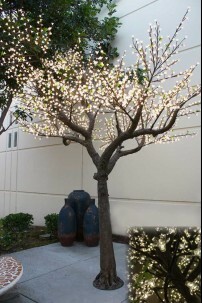 THEY ARE NOT DESIGNED FOR PERMANENT OUTDOOR INSTALLATIONS. 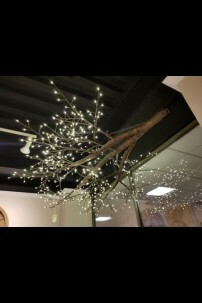 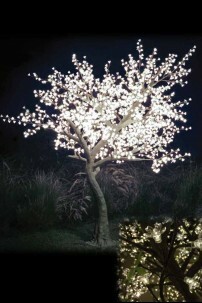 480 WARM WHITE LED BRANCH CHANDELIER, NATURAL, 6 1/2' W X 7' L (316243) ..
480 Light, Warm White, Natural Trunk Twig Tree **Starlit Forest trees are a water resistant p..
1632 Light, Warm White, Natural Trunk Twig Tree **Starlit Forest trees are a water resistant ..
BLOSSOM TREE 880 LIGHT 48"x48"x84" **Starlit Forest trees are a water resistant product, best..
Blossom TREE 2120 Light 72 x72 x108 in **Starlit Forest trees are a water resistant product, ..
BLOSSOM TREE 5200 LIGHT 96 x96 x168 in **Starlit Forest trees are a water resistant product, ..
2600 Light, 15' Warm White, Clear Blossom with a Natural Trunk **Starlit Forest trees are a w..
880 LIGHT MAPLE TREE, BLACK TRUNK, WHITE LEAVES - 48" Width x 48" Length x 84" Height *Ships by p..
2120 LIGHT MAPLE TREE, BLACK TRUNK, WHITE LEAVES - 72" Width x 72" Length x 108" Height *Ships by.. 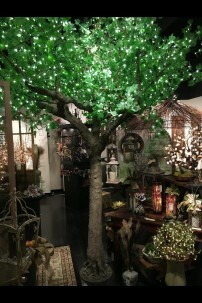 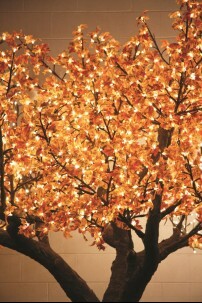 MAPLE TREE 880 LIGHT - 84" Height x 48" Width **Starlit Forest trees are a water resistant pr.. 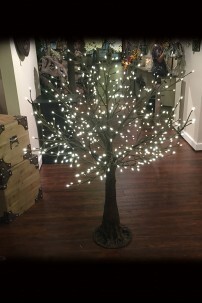 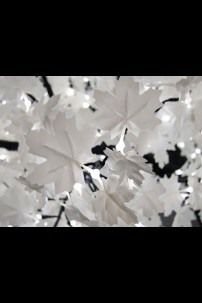 MAPLE TREE 2120 LIGHT 72 x72 x108 in **Starlit Forest trees are a water resistant product, be..
2600-LIGHT, WARM WHITE, NATURAL TRUNK, WHITE MAPLE, 11'H **Starlit Forest trees are a water r..
2600 LIGHT MAPLE TREE, WARM WHITE, NATURAL TRUNK, RED LEAVES 14'H **Starlit Forest trees are ..
14' GREEN MAPLE TREE WARM WHITE **Starlit Forest trees are a water resistant product, best su..